Only 7 days into 2013, and my "Year of the Kid" http://pixiedusthealing.blogspot.ca/2013/01/2013-year-of-kid.html resolve got challenged in a pretty big way yesterday. Perhaps what happened was I experienced part of the negative aspects to being a kid. But I've come out the other side stronger as a result and that's what being a kid is about too. And best of all, because I have my own blog, I get to share my experience! Whether you read it or not is up to you! First... the background. Because of my Inner Child commitment, I have started to look at things in my life from a new perspective. One of those "things" was a work project that in my previous life I would have considered a "commitment" and a "have to do no matter what". I've been struggling with this as many of my friends know because they have at least pretended to listen to my angst about it. It was for sure- NOT FUN. I tried coming at this from multiple different angles including attitude change, readjusting things, the works. Yet I couldn't make it feel right. It was just wrong for me, my Inner Child kept screaming. And I couldn't twist it into anything that felt okay. So, in a pretty much unprecedented move for me, I quit. I did not do this lightly. I did not do this without angst. I knew it wouldn't be easy. But, I followed my hear, my intuition, my emotions and my "kidness". I armed myself with cue cards to help me keep my resolve and not be cajoled (a.k.a "guilted into) into trying to make something else work. I even put an "I will not be bullied" sign up on my cork board because I guess I had figured out what type of kids I was playing with and that's part of why I decided to quit the team! Having got past the angst of the decision, and having made my cue cards, the actual quitting process went remarkably easy. Things went very smoothly. No emotions.. done deal. I did my happy dance. I took a friend out for lunch. I was on top of the world. I felt so much lighter. I got ready to get back to putting effort into some projects that really do feel good and that been neglected a bit during my struggle. Here's the thing I now understand. Cyber bullying is way worse, in my opinion, that the physical bullying of my youth. I've taken perhaps more than my fair share of physical punches. No doubt because I've given them as well. At times I guess I was a bit of a "scrapper" and it even because part of the occupational territory at times in my life. But rarely is anyone really sucker punched without having some idea that it's coming. You know if you're walking in an unsafe neighborhood or about to meet up with the bullies and you brace yourself if you can't avoid it completely. Even if the punch comes out of no where you have a second before impact to tense up or adjust position. A part of your fight or flight response registered the body language of your opponent and prepared you. Not so with an email bully. There was no behavioral warning sign that my body has figured out to see this one coming and anticpate it. This came from someone I thought was professional and who I had had nothing but professional dealings with. This was not the person I'd had the phone call from- it really was kind of a "Hench man" I guess. That is the way bullies work. The thing with a cyber bully attack is that the message takes on a whole life of it's own. There is more energy in some ways than a physical impact. You keep reading it over and over again and allow that energy to keep hitting you. It's really hard to stop yourself. You keep thinking you must have read it wrong, interpreted it wrong, have been overly sensitive. You look back to see who else was cc'd on this and has also therefore ganged up on you. It's hard to walk away from it. It just sits there in your in-box. Wise Woman and I have talked about emails before. We believe there is a real energy behind them- either good or bad. There is power in the written word and this seems even magnified in cyber word. You can really feel the energy, the hatred, the panic, the maliciousness, and thankfully the love and positive side of things as well. Sending out an email is so different than a phone call. I've had my share of screaming phone calls before I guess. Geez... maybe I really am a "scrapper"?? But at least with a phone call there is a pretense that you want to share something. You might possibly be looking for my side of the story. I might be able to share something of how I feel with you. It takes more time and courage to make a phone call. You at least start out thinking about what you will say. Certainly either one of us can hang up. It's not really the same way with an email or cyber bullying. I have really gained appreciation for what kids are going through as a result of my experience. I know my experience is no where nearly as bad as what happens when stuff goes on on social media or private things are shared, but at least I have an inkling of tough it is for kids. And, in my opinion, it really is tougher than when "we were going through it". A sucker punch or a cyber punch, at least for me, is a hit to the third or Solar Chakra. It's a sudden loss of the feeling of personal power. It's a hit to feelings of self-worth, and in fact the very definition or sense of who you are. http://pixiedusthealing.blogspot.ca/2010/12/food-for-solar-chakra.html It's no coincidence I don't figure that an unbalanced third Chakra can manifest with digestive problems. I actually felt sick to my stomach when I read that email. When you live your adult life from a kid perspective, you do have more resources. I had my trusty box of Bach Flower remedies. I took some drops of Mimulus. It's indicated for fear of known things. My sense of security in myself had been thumped right out of me and I couldn't even think straight because of my emotions. That's what Mimulus is about. Star of Bethlehem might have been helpful for a sense of shock but that wasn't quite what it was for me. In fact, I might have been expecting this all along- just not prepared for it. I've written lots of ideas on Bach for different aspects of bullying For me, this time it was Mimulus that helped. Once the Mimulus "kicked in", I was able to think my way through to doing some other things. In the meantime, I'm going to exercise my "blocking abilities". I'm going to talk to the kids in my life about it- in fact, I already have started to do that. It opened up some interesting conversations. Some kids have stopped signing up to some social media or ignore their accounts and have moved on to more selective sites where they can better select what they want to read and what they want to share. Whether we want to admit it or not, cyberland is kidland and they know the rules and possibilities better than we do. It's time we listened. I'm also going to be very careful about when and how I send my own emails. I'm going to think about the energy I'm putting behind my words. I'm going to consider whether or not I should be making a phone call or having a person to person conversation instead that might take a little more nerve, and at the same time be showing an ability to accept there could be another side to this. Maybe the old "count to ten" before you type and send could be appropriate here. It turns out "block sender" and Mimulus both help me to "Be the Boss of Me" http://pixiedusthealing.blogspot.ca/2012/11/the-boss-of-me.html I like that! I also used The Violet Flame http://pixiedusthealing.blogspot.ca/2011/09/detachment-from-drama-tornadoes.html to get that kind of energy right out of my life and I believe that helped as well. Sometimes letting go of your roots means quitting the team that allows a culture of bullies to survive. I get to pick who I play with. 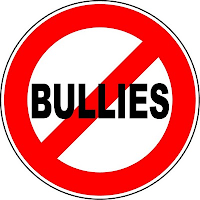 No more bullies allowed!